The Fellowship was fortunate enough to obtain a copy of ADVENTURE TIME: MARCELINE AND THE SCREAM QUEENS #4 from KaBOOM Studios. The stories are written by Meredith Gran and Ananth Panagariya, with art by Meredith Gran and Yuko Ota. In the first story, the band travel to Sound City to perform a concert. Just one thing, the town is under water! The Princess checks in on how things are in Candy Kingdom, but doesn’t like what she hears. And what is “the calm?” In the second story “The Bootlegger,” someone is making counterfeit tickets to the concert. I admit that I don’t read the main book and have watched half of one episode of ADVENTURE TIME, so I’m a little lost with what is going on in this issue. While the main story is a little confusing, the backup is pretty straight forward and pretty funny. Both stories feature the unusual art style from the animated show – not that it’s a bad thing. If you are a fan of the show or comic you will more than likely enjoy this book. 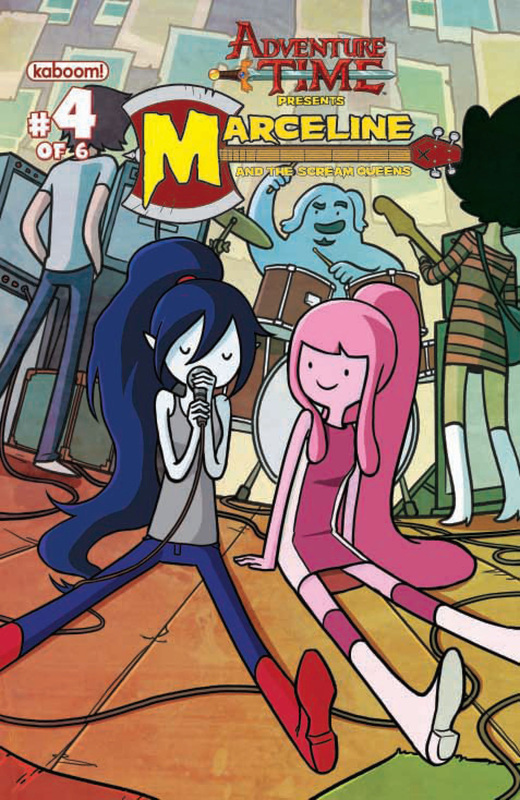 ADVENTURE TIME: MARCELINE AND THE SCREAM QUEENS #4 is in stores now and available at www.kaboom-studios.com.